Hi, I am interested in your 1969 Pontiac Firebird (stock #5150-CHA) listed on Autotrader for $29,995. I'd like to get more information about this vehicle and confirm its availability. Take a moment to understand how this 1969 Pontiac Firebird gets it all right. The exterior has a cool setup finished in bright red. Youve got the right features inside, like A/C. And the original V8 block has been cared for and by the way, you control it with a four-on-the-floor. So take a look at the muscle car that fulfils the wish list. An iconic hardtop classic like this always looks great when someone takes the time to give it a bold red upgrade. And this has the kind of deep luster that loves the sunshine. Plus, the artful front bumper, headlight bezels, and Rally II wheels add to this shine. But its not the bright side that really makes this distinctive; instead its this coupes dark side. The glossy black down the hood highlights the power bulge in the metal. Plus, it coordinates with the chin spoiler up front and the blacked-out panel in the rear. So this car really has a nice mean streak in the red. Inside is more of the black we love. This feels like it has a high degree of well-kept originality on the bucket seats, carpeting, door panels and headliner. This darkness is broken up by some nice wood-like panels on the center console and around the gauges for a nice premium feeling. In fact, this feels quite premium thanks to the air conditioning being upgraded to modern R134a. They also upgraded the three-spoke sport steering wheel and shifter, so that this muscle car really feels great in your hands. Under the hood is the original numbers-matching 350 cubic-inch block dressed in the proper Pontiac turquoise. It even has the classic callouts on the air topper. You can instantly see this original V8 has been upgraded for extra power. This includes heads, an Edelbrock intake, and a new Holley four-barrel carburetor. So this enhanced V8 makes a wonderful growl at idle, and you really get to control the full sound and fury thanks to the four-speed manual transmission. Plus, with power steering, front disc brakes, and sway bars front & rear, they really gave you one great package for both cruising and power driving. 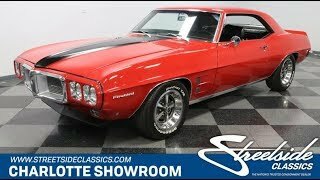 This classic Firebird gets it right, and thats why you know you need to call right now before its gone. Call now!